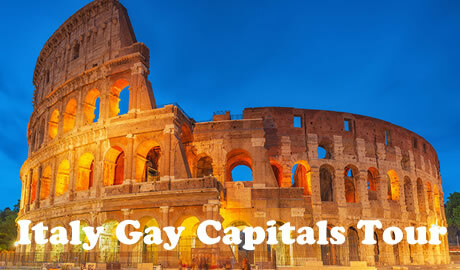 Join Italy Gay Travels on an amazing Tour of the Italian Gay Capitals: Rome, Florence and Naples. Yes, take in all the key sights in one tour! Rome & Florence have one thing in common: they have been Capitals of Italy since 1861, the year Italy was unified. You too can now join the unification on the Gay Capitals exclusive tour! Start your journey from Rome, the most recent Capital of Italy. Find your inner gladiator and see for yourself why everyone falls in love with the Eternal City. Classical architecture, Imperial heritage and not to mention world known cuisine await you on this Gay Capitals Tour. Our Guided Tour of the Vatican Museums also gives insight into the untold gay history of one of the best known museums of the world. 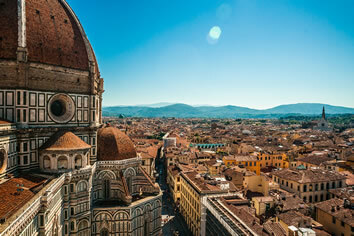 Next it is off to Florence, the second Capital of Italy (1865-1871). Immerse yourself in the Baroque soul of the world that is of course, Florence. 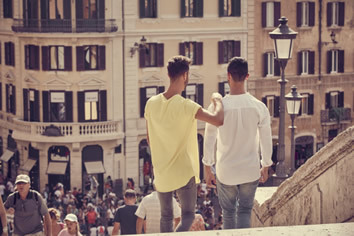 Guided tours and sunset views on ‘Ponte Vecchio’ are but a few os the tantalising surprises on this Gay Capitals Tour. 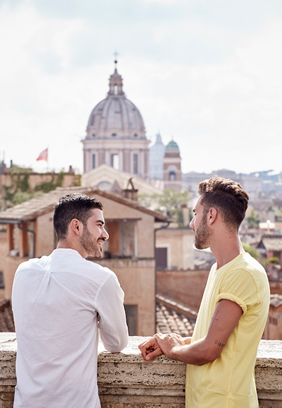 Guided tours and sunset views on ‘Ponte Vecchio’ are but a few of the tantalising surprises on this Gay Capitals Tour. Finally Naples: the World Capital of Pizza! You will discover this charming seaside city, full of life and history! • Historic tour of the Roman Empire, find your inner gladiator! Welcome to Rome: the Eternal City! This is a destination on everyone’s bucket list and our Gay Capitals Tour naturally starts here. Make your way to your accommodation, smack bang in the centre of the city and settle in. Here you will meet your hosts and get your Gay Capitals of Italy Tour welcome pack. Join your fellow Gay Travellers and your tour hosts in the evening for a Complimentary Welcome Dinner near the Colosseum. Here we will all get to meet each other and have a full briefing on the adventure that lies ahead. After dinner (Roman Style) we go gay bar hopping: the first Drink is on us! After a hearty breakfast we take in our first visit: a guided tour of Classical Rome. We will visit Villa Borghese, Rome’s most beautiful park, close to the city’s historical center. Inside the park we will join a tour of the beautiful Galleria Borghese, house of a Museum hosting a vast and diverse collection of sculptures and paintings produced by Italian artists such as Bernini, Canova, Caravaggio and Tiziano. Free time in the afternoon to enjoy lunch and stroll around Rome as you wish or take a siesta. Free time in the morning to enjoy the beautiful capital of Italy at your own pace. You can make the most of it by adding a guided tour of the Vatican Museums and Sistine Chapel (skip-the-line entrance fee included). After lunch on your own, we will meet again in the early afternoon to enjoy a private walking tour in the heart and soul of Rome. Key sights include Piazza Venezia, to admire Il Vittoriano, the massive faux-classical monument to Italy’s Vittorio Emanuele II as well as the Church of St. Peter in Chains. The final stop is a tour of the magnificent Colosseum. No fighting over the artefacts boys unless you want to put on your armour and sandals and give us a show! Soon after the guided tour, everybody will be free to relax as they please, before heading to dinner in the trendy Trastevere area. This dinner is on us! After breakfast, we will take the High Speed Train to our next Italian destination: Florence. In only 2 hours we will reach the Baroque Capital of Italy. Here you will check-in at the hotel and have some free time to enjoy lunch. An afternoon tour of Florence is next on the Gay Capitals of Italy Tour. Discover incredible masterpieces including David: Michelangelo’s masterpiece, in the Gallery of the Academy of Florence. Admire the magnificent Santa Maria del Fiore, celebrated for its magnificent dome designed by Brunelleschi, peer into the Baptisterys’ renowned ‘Gates of Paradise’ by Ghiberti. Spend time in Signoria Square and end the tour at the splendid Ponte Vecchio, known as the ‘Old Bridge’. Later, Italy Gay Travels invites you to join a charming aperitif near Piazzale Michelangelo to appreciate the sunset above Florence before heading to dinner. Optional typical dinner in the area of San Niccolo’ in Oltrarno. After breakfast the group will join a tour of the Uffizi Gallery which provides insight into the history of the structure and its collections. Admire the famous works of Giotto, Botticelli and Leonardo da Vinci. Afterwards we head to the Boboli gardens (entrance fee included), situated behind the Pitti Palace. Boboli Park is the most famous park in the city of Florence. Here the Medici family created the model of the ‘Italian garden’ which was a source of inspiration for many European courts. Enjoy the rest of the day to explore Florence on your own, doing some shopping or relaxing at the hotel. After breakfast we take a High Speed Train that brings us directly into the World Capital City of Pizza: Naples, only 3 hours away. Check-in at the hotel and enjoy the rest of the day as you like. Relax, enjoy some shopping, head to the beach: it is up to you how you want to spend the rest of the day. After breakfast the Gay Capitals of Italy Tour group will meet to join a guided private tour of Naples. We will visit famous landmarks such as the Royal Palace, the Spanish Quarters and the Maschio Angioino. After lunch we reconvene to reach Castel dell’Ovo, a seaside castle whose name derives from a legend about the Roman poet Virgil and the oldest standing fortification in Naples. From here you can enjoy the beautiful sea view and admire Mount Vesuvius. From Castel dell’Ovo we will reach Posillipo, the romantic residential quarter of the city located along the northern coast famous for its houses by the water. 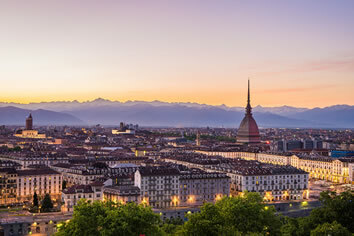 Later in the afternoon we will enjoy a tour around the famous Piazza Bellini, a bustling Piazza in the center of the city where you will find a multitude of gay friendly restaurants, cafes, and bars and the heart of the Gay night life of this city. For the Farewell Dinner we will enjoy the best Pizza in Town in the center of Naples, on us of course. We will finish the night bar hopping and discovering the gay nightlife of Naples. After breakfast, we all say goodbye (no tears hopefully) and hope that we see you the next time in Sunny Italy. If your flight back is from Rome, there are frequent and fast High Speed Train back to Rome, only 1 hour away. fly out from Naples (NAP), or Rome (FCO, or CIA) airports. En suite rooms in 4 star Hotels and B&B. This tour is accessible to anyone in relatively good shape. There will be a fair amount of walking. You will be provided with an assistance number you can call us at any time during your stay.